Groundbreaking for new Criminal Justice Building at DMACC. 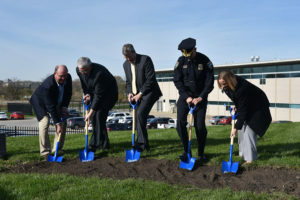 Work is now underway on a new building on the Des Moines Area Community College (DMACC) campus in Ankeny that will serve as a training ground for crime scene investigators. Faculty member Danielle Galien says the Criminal Justice Training Facility will be 1,500 square feet and be set up like a house. She says it will have moveable wall, a basement classroom and observation room, and the whole building will have cameras to allow them to watch what they are doing. Galien says the building will be used in many ways. This is believed to be the first facility of its type in Iowa. Galien is looking forward to having the building, as she says they now have to use practice crime scenes in current buildings and hallways, and that presents some problems. “We get a lot of weird looks and security, we usually have to tell them, because sometimes we have blood all over the place or different types of evidence is laying there. Or they are outside in the grass and we just hope it doesn’t rain,” she explains. The building is expected to be open for classes in the fall of next year.